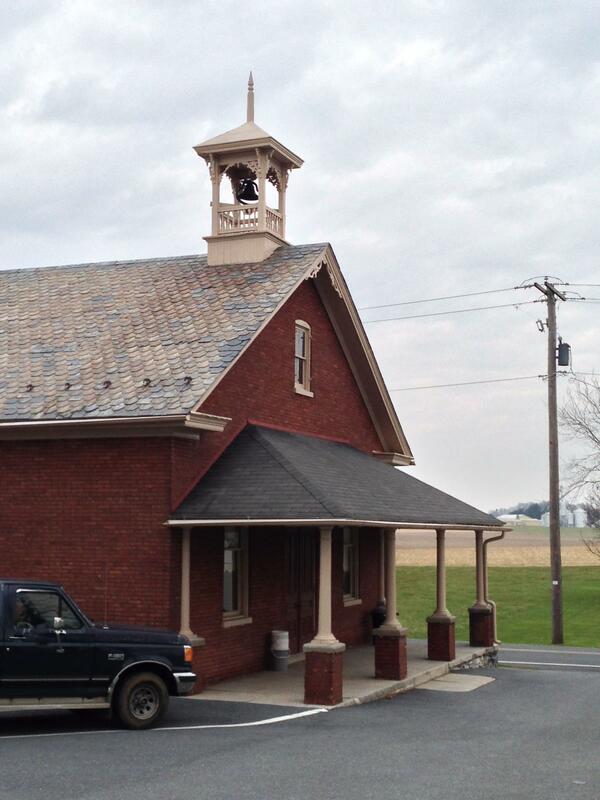 When I was about 6 weeks old, my parents took me to church–Bossler Mennonite Church close to Elizabethtown, PA. 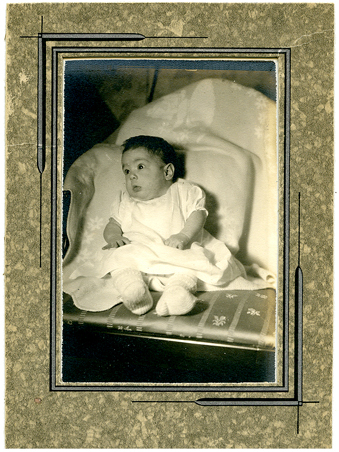 I was born in July–9 months, almost to the day, from my parents’ honeymoon night the previous October. 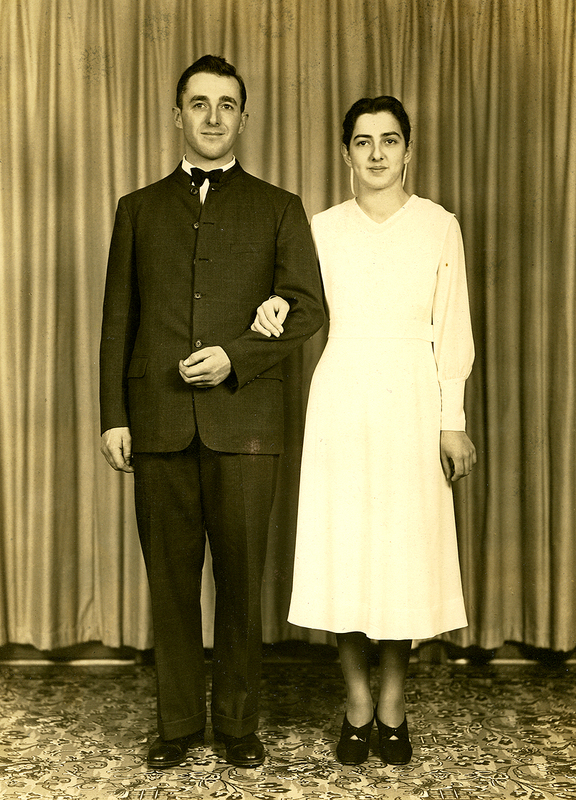 When I got older and could figure out such things, my mother simply said, “Nothing happened before we were married.” She said it, so it must be true. In those days, abstinence was the professed norm for engaged couples, and a white dress almost certainly meant the bride was a virgin. 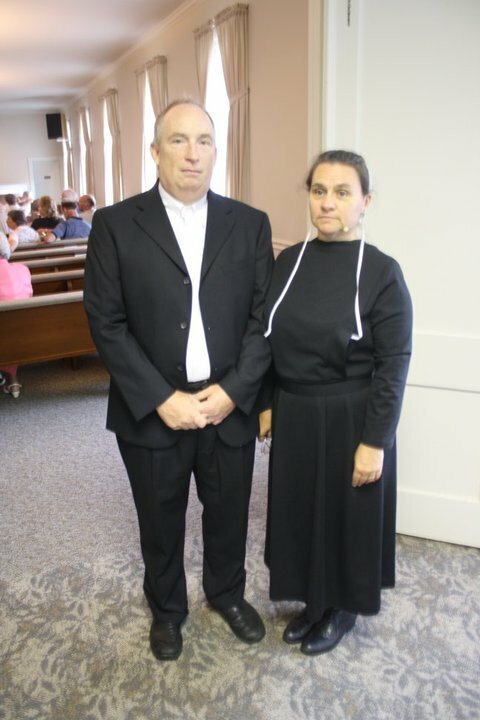 A couple whose first child arrived too soon after the wedding date had to appear in front of the congregation and confess their sin of fornication. The Christian Mingle of the 50s and 60s happened after the Sunday night service with girls and guys in separate groups lingering, a girl hoping for a guy to break out of his circle and ask her for a date. 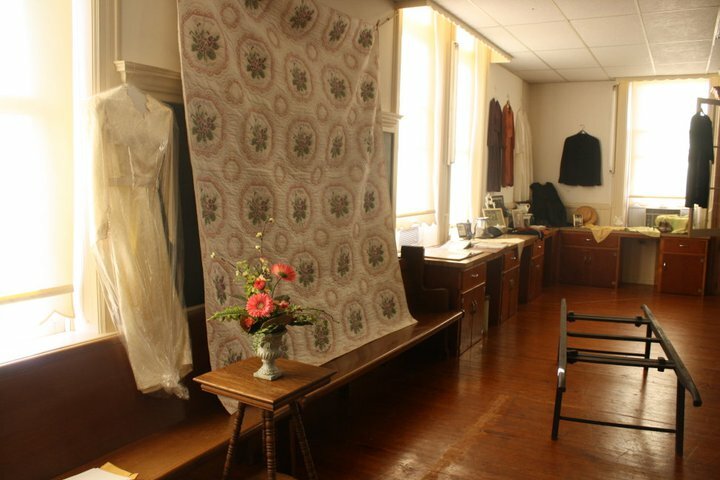 Weddings were frequently held in the fall, not in summer, after crops were harvested and the family and relatives had more time for big social events. 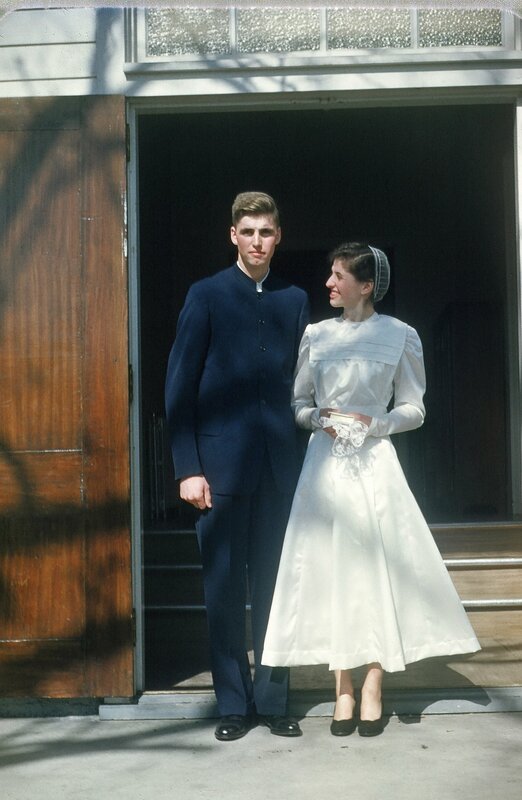 Here is Dad’s first cousin, Ruth Longenecker, all decked out in her caped, white wedding dress and black shoes gazing at her tall, blond groom who wears a plain suit and no necktie. She carries a lacy handkerchief, something fancy, inserted into a white Bible (flowers were forbidden then) as she walked down the aisle. 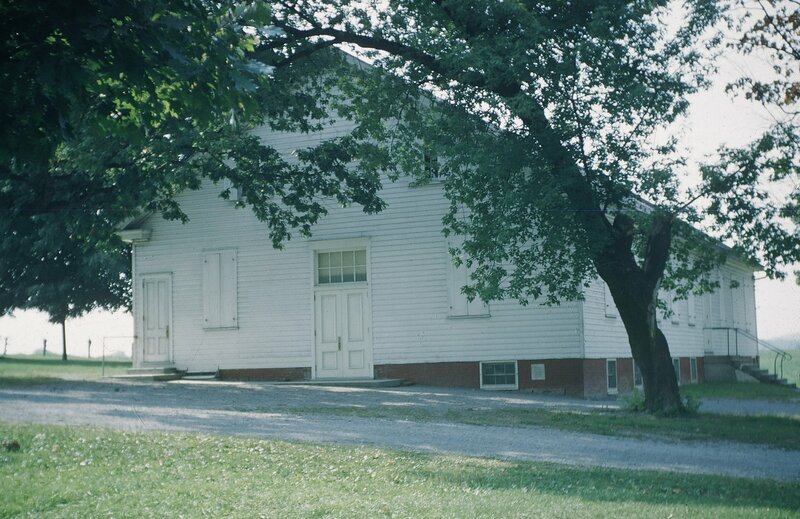 Bossler Church, which celebrated its bicentennial in 2011, was not at all fancy: white building with no steeple and a separate door for the women to enter at the left of the main entrance. The interior too was spare with a middle aisle separating two rows of benches, the one on the right for the men. The other on the left for women. When Mr. Christian Clown Daring Do visited with me one Sunday, he plopped down on the women’s side, mortifying everyone including me. 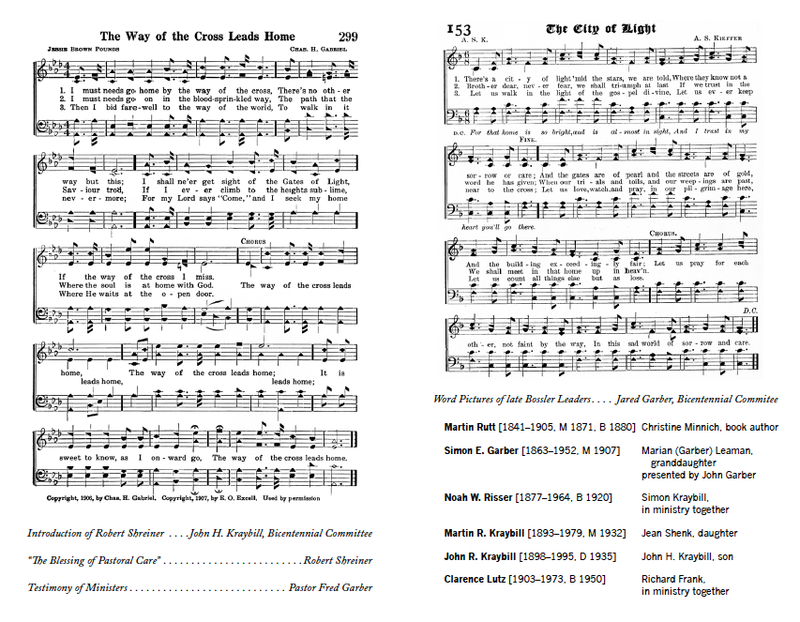 The separate sections, however, made for a wonderful blend of voices when we sang a capella in four-part harmony. No piano or organ in sight. 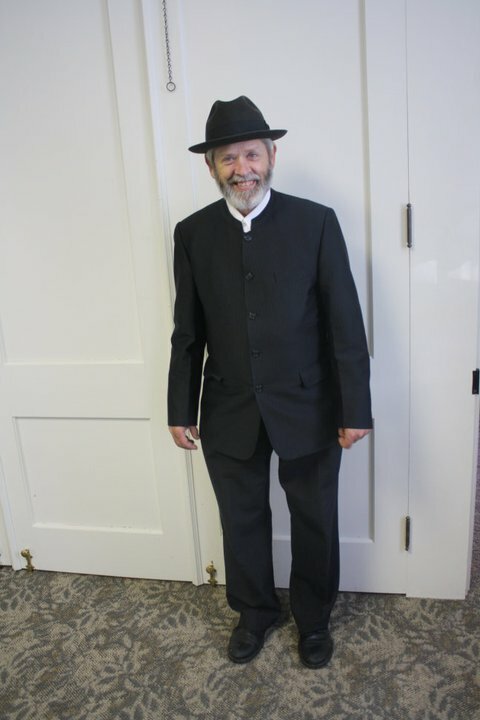 Of course, no fancy garb for members or minister: plain coat and sometimes a beard for the men, and a caped dress with a prayer veiling for women. Usually the older women had black ribbon attached to the veiling while the younger ones had white ones. Gilbert Stuart’s painting of Washington and Lincoln, an American flag, and little cards for each letter of the alphabet, printed lower and upper case set above the blackboard. 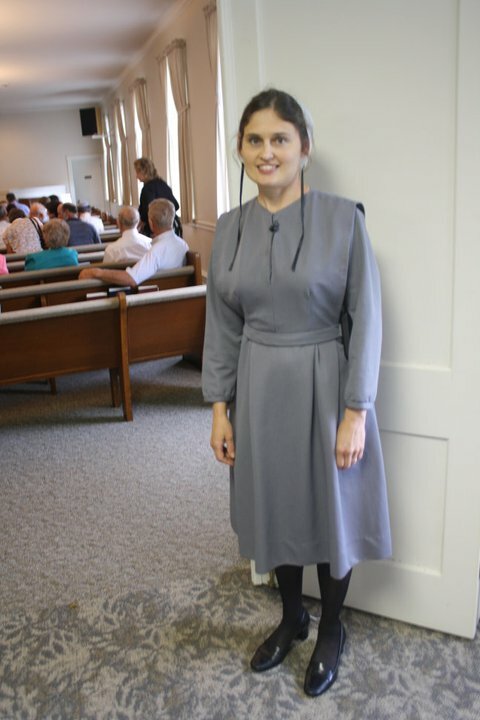 For Mennonites, the church was the hub of social life. When Howard Longenecker’s barn burned down, twice, men were on hand for the barn raising. 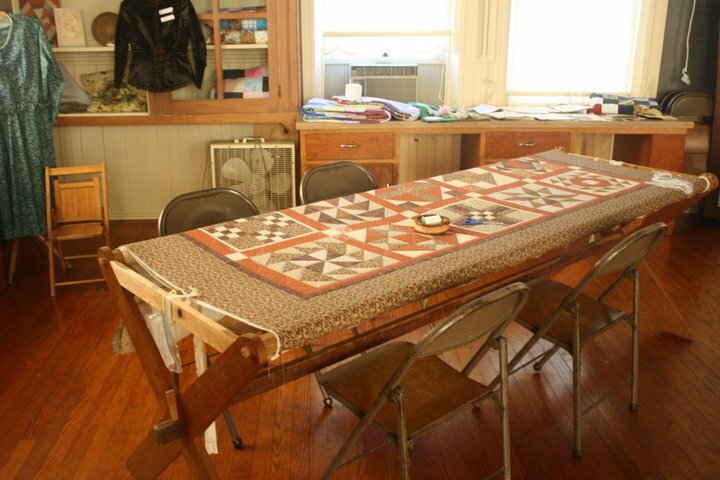 Women gathered regularly in an anteroom at the church, or, later, at the school for sewing circle where they made comforters, baby blankets, and quilts. To some, my story seems quaint and odd. To others, it resonates because you share a similar heritage. 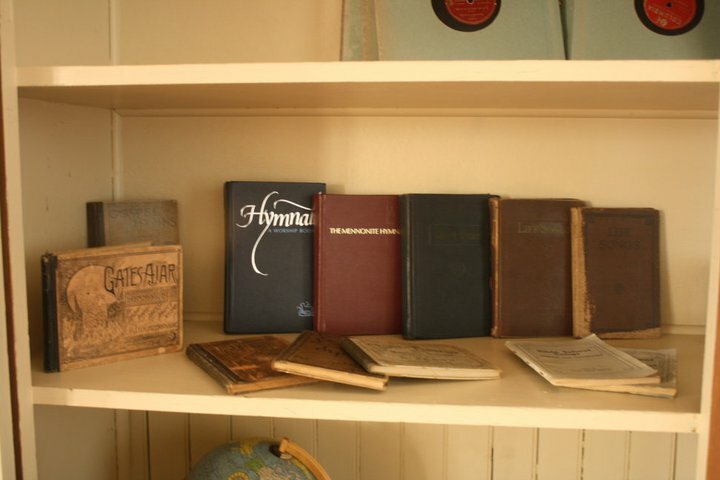 What experiences in your childhood or teens do you think curious readers would like to know about? Always look forward to your stories and quotes. The Mennonite church is very similar to the white clapboard Baptist church I went to as a child and teenager. However, no dividing of the sexes, maybe that would have been helpful! Glad you chose the ‘fancy’ life over the ‘plain’ life. Suppose you didn’t have a choice with “The Clown” husband. He makes us all laugh, especially in a long purple choir robe and a blond wig. I loved seeing these pictures, Marian. You were a little ahead of me in age and in conservative dress. 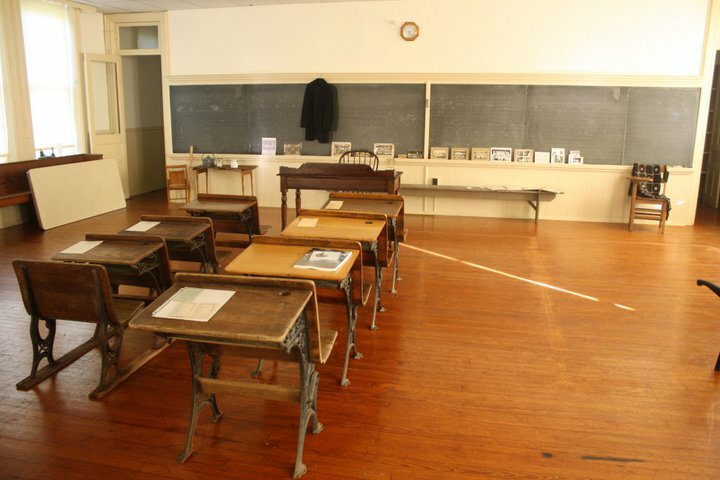 What fascinates me is how much variety there was in plainness. My Hershey family was plainer than my Hess family, for example. But looks like the Longenecker family was even plainer. I love your conclusion about beauty in both. And the line from Keats is one of my favorite’s also. I’m so glad you are a part of the fancy community now with a foot still in the plain. You have such wonderful stories and relate them so well you feel like you are there. 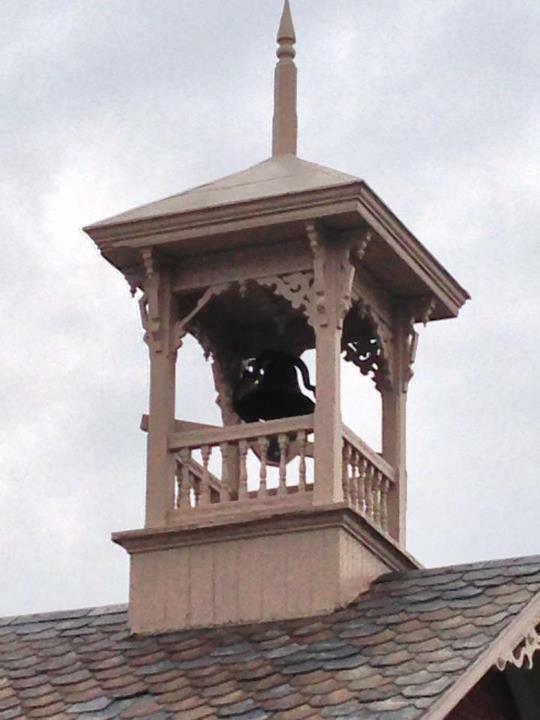 I couldn’t stop laughing about “the clown” sitting on the wrong side of the church. Thanks for sharing. You know the clown quite well, which brings the story even more to life. I’m glad you are enjoying the stories, Annette. I am laughing about the clown on the women’s side, but KNOW he did not make a mistake! Too funny! 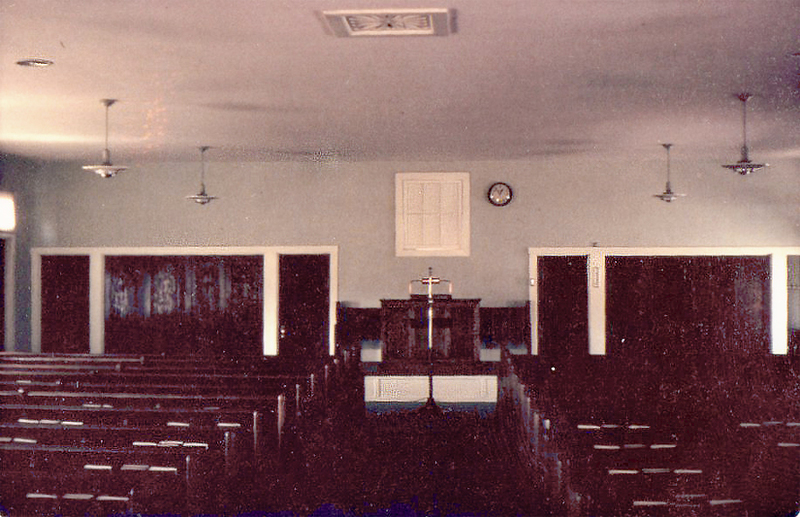 My grandparents’ church had separate seating and they were Baptist – not Southern something else in the backwoods of western KY. Of course, my parents’ generation changed that and they sat together. I LOVED sitting with my grandmother, while my grandfather sat on the other side of the church sleeping. THAT is probably why the men wanted it separate, so they could sleep without being elbowed. Give the clown my regards! Your comment made me laugh – and I’m seeing it now in 2015. How did I miss your wonderful, wonderful corn pone – ha!